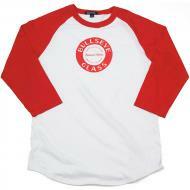 NEW Chosen by a vote of our Facebook fans, this sporty three-quarter-sleeve baseball tee is a real winner. Fine 100% cotton jersey, combed for softness and comfort. Red/White Unisex. So far, you have no items in your cart. Adding $200.00 of items to your Cart will move you into the 10% discount tier for eligible items.